One of our readers asked us to put together an article covering tips for removing a wall to open up a room. So let’s say you’ve decided to open up the living space in your home. You have determined that by removing a wall between the kitchen and the great room, you will be able to entertain a larger crowd at family gatherings. So how do you go about removing a wall to create a more inviting space? Step 1: Determine whether the wall carries a load from above (i.e. load bearing wall). Step 2: If the wall carries a load, have your architect re-design for proper support. Step 3: Check to see what mechanicals (i.e. plumbing, HVAC, & electrical) are in the wall. If there are a bunch of mechanicals in the wall, you may decide to leave it as is due to the extra expense. Today we will go over step 1 of our tips for removing a wall in more detail. Since this step is so complicated, we will cover the rest in the proceeding posts. A word of caution…we are going over some general items here for removing a wall. Because there are so many different styles of homes and so many different types of building methods, some of the items we talk about may not apply to your particular home or situation. You should consult a qualified architect before making any structural changes to your home. Check out this video for tips on finding a good architect. 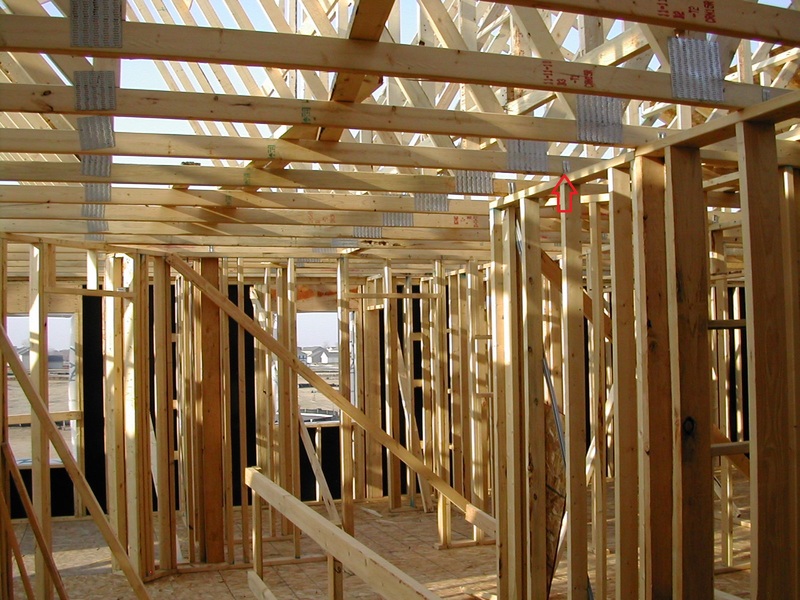 If your home was built with roof trusses, there may be intermediate load points (places where the roof trusses rest on the wall below for support). In the picture above, the red arrow indicates the loading on the wall coming down from the roof trusses above it. This can occur at the inside wall of a vaulted room and sometimes at mid span of the truss. If your builder left you the roof truss layouts, or you can obtain them from the truss supplier, you can easily find the load points before removing a wall. The individual truss sheets in the layout (also called cut sheets) show where each truss is designed to be supported from below. Do you have an older home that you are removing a wall in? If you do, your home may have rafters for roof support instead of manufactured roof trusses (this also happens in some newer homes because of complicated roof designs or lack of truss plants nearby). If your home has rafters, you have a bearing wall where the rafters terminate. Let’s say you have a vaulted room for example. The walls that are perpendicular to the rafters (and connected to them) will be load bearing. For a two story home, you will typically have a load bearing wall on the first floor close to the center that runs perpendicular to the floor joists. This wall breaks up the span of the second floor joists. You can use a stud finder to determine which way the floor joists are running. Since floor joists have a limited span for each size available, this load bearing wall keeps you from needing stronger, more expensive joists. 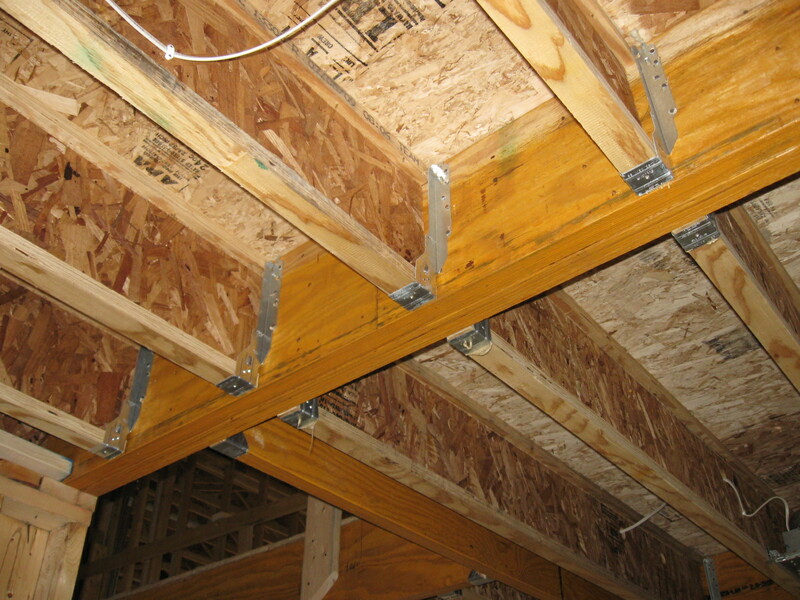 The walls that are parallel with the floor joists above are typically (but not always) non-load bearing. 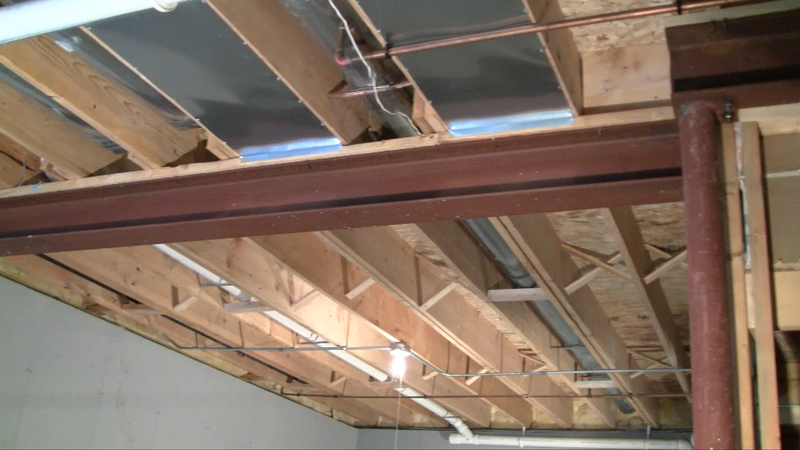 If you have a basement, the beam locations will tell you where the major bearing walls are…basically above the beams. The basement beams are there to carry the loads from above. If you have the architectural plans for the home your are removing a wall in, take a look at them…most of the time they will tell you which walls carry a load from above. So if you remove drywall from a wall and there is a steel or wood column or several studs sandwiched together, you most likely have a bearing point (bearing point = weight concentrated at a single point) coming down from above and therefore have a load bearing wall. One word of caution…you may have a concealed beam up in the ceiling as shown in the picture below. If this is the case, you will have a concentrated load at the ends of the concealed beam. Basically, this beam carries half of the weight from the joists connected to it. If you have this scenario, you need to make sure the ends of this beam are properly supported. The ends of the concealed beam create a point load. We will typically place columns (or multiple studs sandwiched together) under the point load to support the additional weight. If you are interested in removing a wall in your home, stay tuned as we will cover the rest of the tips in our next article titled Tips for Removing a Wall to Open up Your Home, Part II. Don’t forget to get your architect involved in any structural changes you plan on making to your home.